You'll be £16.99 closer to your next £10.00 credit when you purchase Major and Mrs Holt's Concise Illustrated Battlefield Guide - The Western Front-South. What's this? Order within the next 8 hours, 43 minutes to get your order processed the next working day! MAJOR & MRS HOLT'S Concise, Illustrated BATTLEFIELD GUIDE TO THE WESTERN FRONT- SOUTH contains many fascinating but little-visited areas by travellers and is hoped that they will tempted further afield than the 'showcase' and sophisticatedly presented battlefields like the Somme to discover some marvellous sites. Many of them have lain virtually 'dormant' for many years (such as areas of the Meuse-Argonne and Champagne) but have recently been renovated and opened up by dedicated local enthusiasts. There are many 'gems' in store in this book. Each battlefield starts with some pertinent quotations by participants, has a succinct Summary of the Battle, Opening Moves and What Happened sections then a Battlefield Tour which follows the same tried and tested formula as the rest of the series of a timed and measured itinerary with historic and anecdotal information at each stop. A detailed Sketch Map showing battle lines and each stop on the route accompanies every battle using the same colour code (of yellow for memorials, purple for cemeteries, blue for museums) as the larger Holts' Battle Maps. Together the two books MAJOR & MRS HOLT'S Concise, Illustrated BATTLEFIELD GUIDE TO THE WESTERN FRONT- SOUTH and NORTH will form the most comprehensive and detailed English-language guides to the WW1 Western Front ever produced. The best selling, exceptionally well detailed and superbly illustrated Holt’s series of Battlefield Guides needs little if any introduction to the vast majority of Family History Researchers, Battlefield Guides/Tourists, Military Historians and other “enthusiasts” who visit the battlefields of Europe and Gallipoli each year, as they are without a doubt the best “companions” anyone travelling to these fascinating areas can take with them. The authors, Tonie and Valmai Holt, operated their first ever guided tour to the trenches and historical sites of France and Flanders in June 1977 and the growth in this interesting area of tourism over the years, can genuinely be attributed to the publication of the now World famous Major and Mrs Holt's Battlefield Guides. Each splendid volume in the series, which includes Ypres, The Somme, Gallipoli, Normandy Landings and Operation Market Garden, is packed full of fascinating information, where historical fact is coupled with informed opinion and together with the numerous full colour photographs, excellent maps and diagrams, together with details of war cemeteries and memorials, up to date tourist information and the easy to follow battlefield tour itineraries - provide the reader with just about everything they need to know for a successful tour of their chosen area. 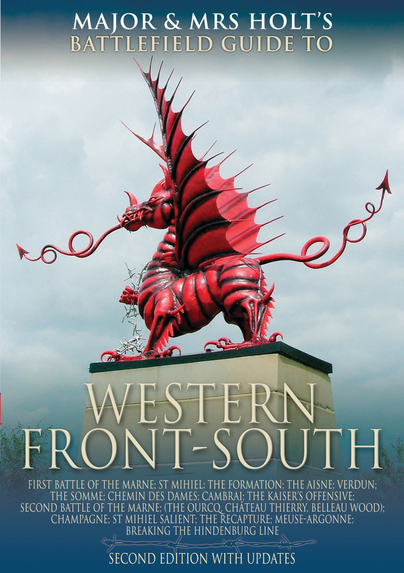 This latest 368 page publication actually includes no less than 400 excellent quality full colour photographs and covers events from the First Battle of the Marne through to the breaking of the Hindenburg Line and the Battle of Cambrai. 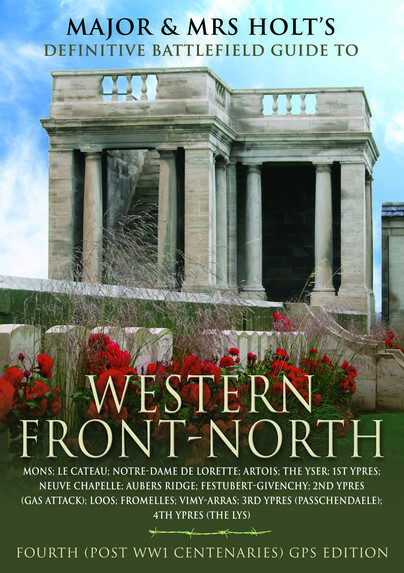 With its companion volume "The Western Front - North", the whole length of the Western Front is now covered in splendid detail, enabling the reader to fully understand and appreciate the significance and importance of the events and actions in this area during the Great War, making it an invaluable addition to any library or bookshelf. World War I Western Front: On the first days, the offensive was successful and the Germans lost ground. Artillery fired a heavy bombardment for 3 days and then the advance began. 2 miles were gained. The next day, reinforcements arrived for the Germans and the offensive lost momentum until it finally ended on October 6. The Germans counter attacked on October 30 and managed to reclaim all the territory lost to the French. The Plan was finally abandoned on November 6. Overall the offensive had been disastrous for the French. They had lost 145,000 Men, while the Germans lost about half that number.